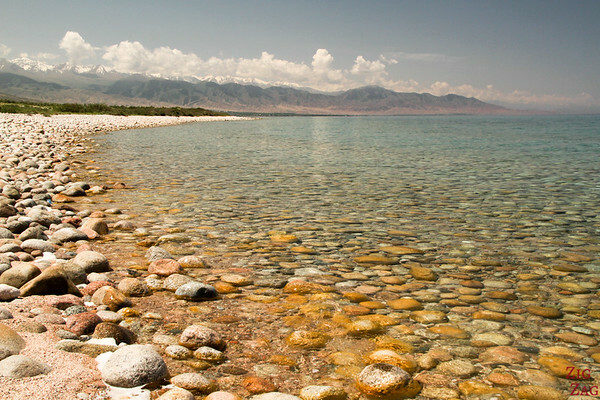 With more than 650 km of shores, you can keep busy around Issyk Kul, the eye shape lake in Northern Kyrgyzstan. The second largest alpine lake in the world offers some colorful landscapes with blue and green waters as well as layers of moutains ranging from red to green, to snow capped white. 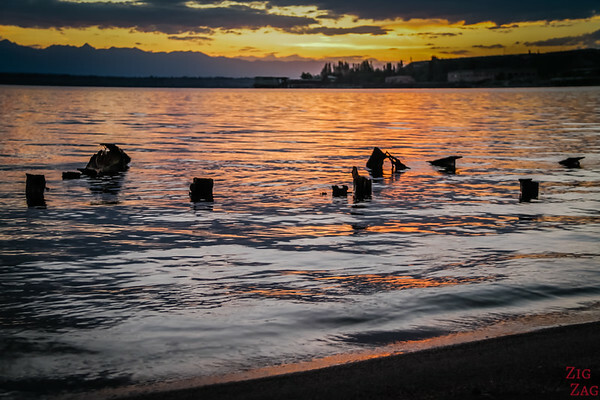 Here is a glimpse of this stunning lake. 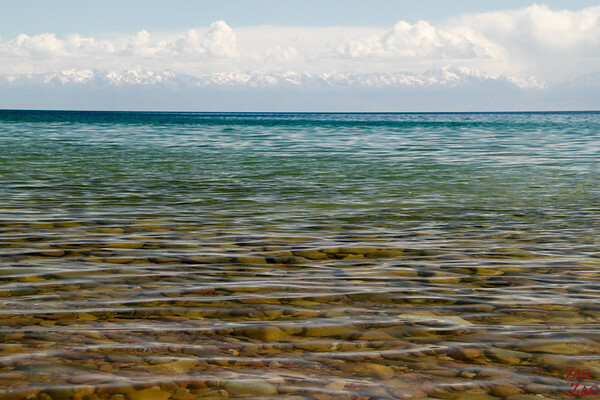 Lake Issyk Kul is the second largest alipne lake in the world (after lake Titicaca in South America) with a lenght of 182 km and a width of 60km. 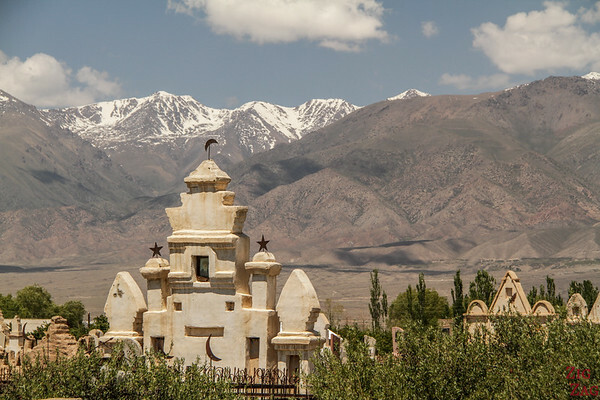 It stands at 1600m above sea level and is surrounded by snow capped high peaks. Beautiful scenery but not easy to photograph. 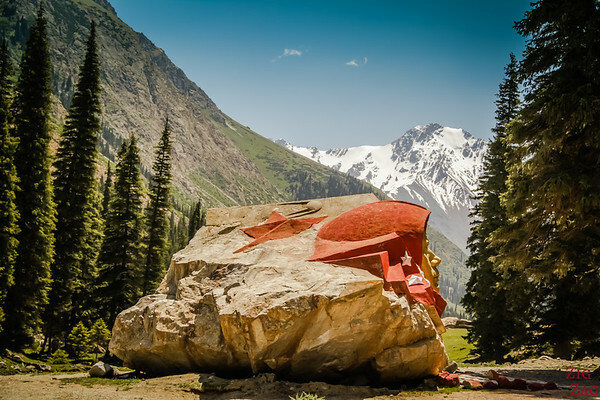 ​The main towns are Cholpon Ata (tourism and balneotherapy) on the North Shore and Karakol for hiker (at the easter point). The South shore has many small villages along the road. 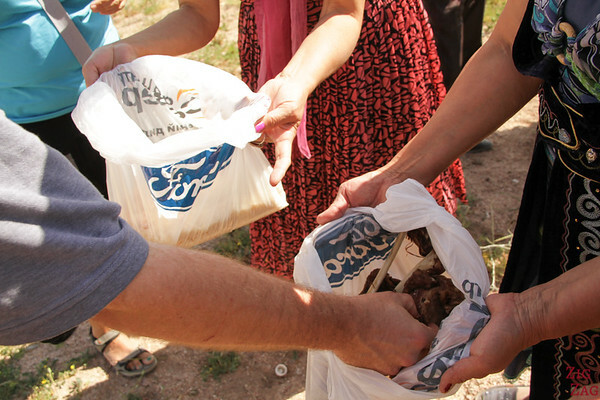 Tamga has become a favorite stop for travelers. Let start by a short video from my 2 days around the lake. You will discover the clear water; you will see it under the harsh sun which makes it difficult to see the mountains across and you will see it under the clouds and with waves that make you believe you are on the shore of an ocean! Even before I spotted the blue of the lake, I could smell it. 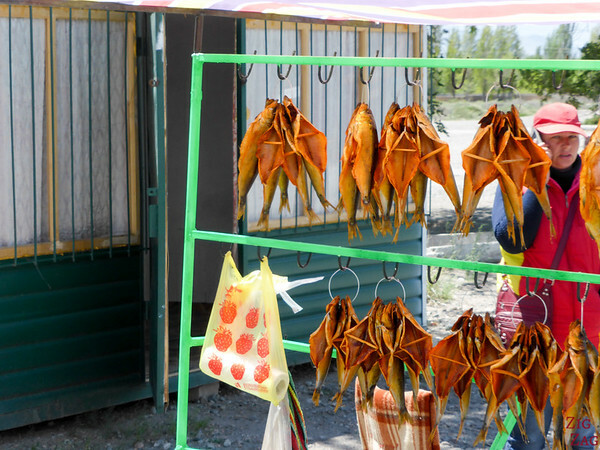 We drove through a village where everyone seem to sell dried fish from the lake! As we approached the lake we stopped to have a look at a cemetery. 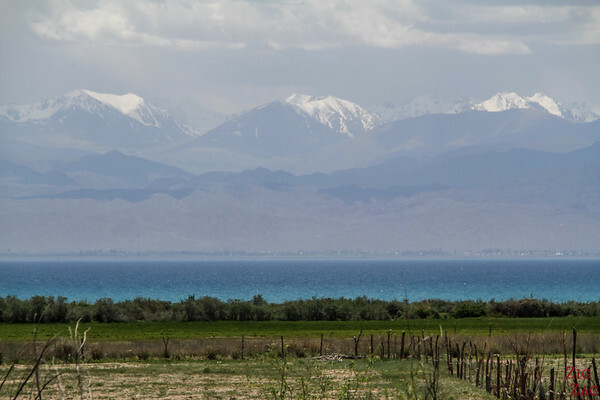 Personnally I was more interested by my first view of Issyk Kul. Very promising! 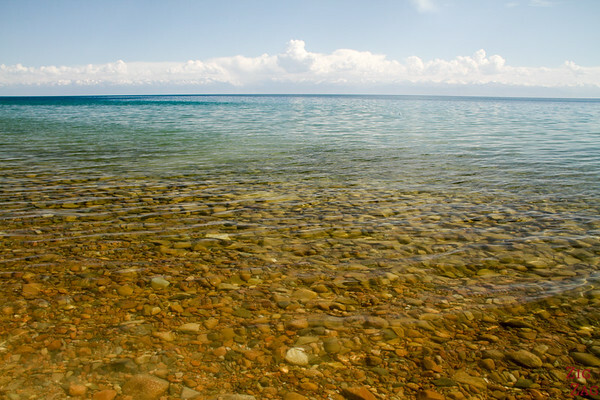 After that I was quite frustrated because there is a lot of private land and we cannot get close to the lake. We arrived at Cholpon Ata and drove slightly up hill to the site of the Petroglyphs. The view of the lake from there was breathtaking. The light was not good for photography but you still get an idea. The blue variations were mesmerizing. Private lands continued after our city break. So when we finally found a space where we could get to the water we jumped out of the bus. 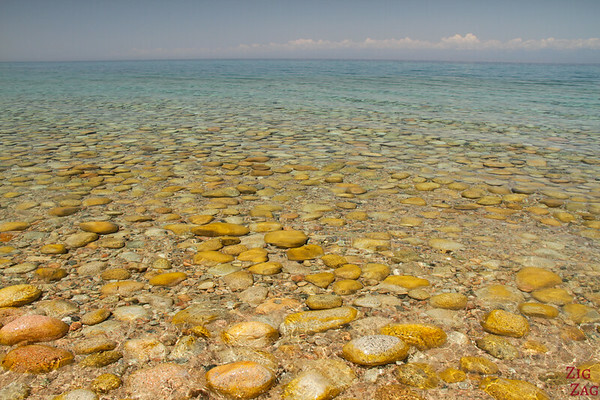 The water is crystal clear and even from the water the shades of green and blue are unbelievable. 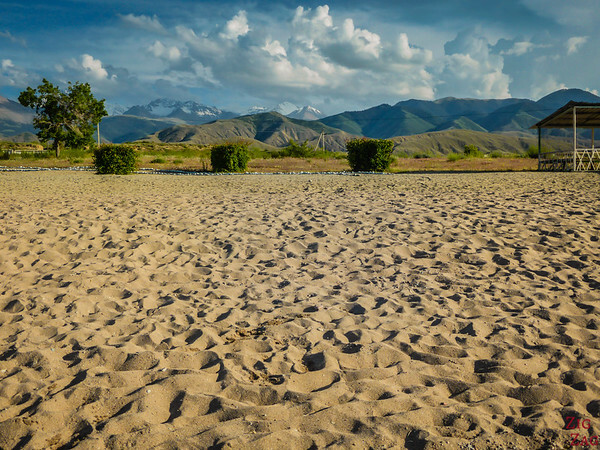 This is where we crossed path with a Kyrgyz family from another region who were on vacation. This woman is the head of the family and the head of a school. She looked very strong. She was happy to chat with us and we took pictures of the whole family. Before we left they insisted we eat a little bit with them. We had already had lunch but could not refuse. So I tried horse meat for the very first time! 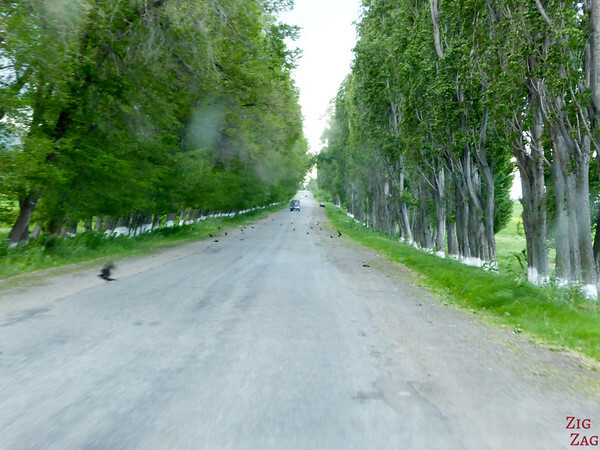 After that the road gets away from the lake and there are trees along the whole way. Sadly it was the period where baby crows hatch. And many young stay on the road as the cars approach. It was not pretty to see. 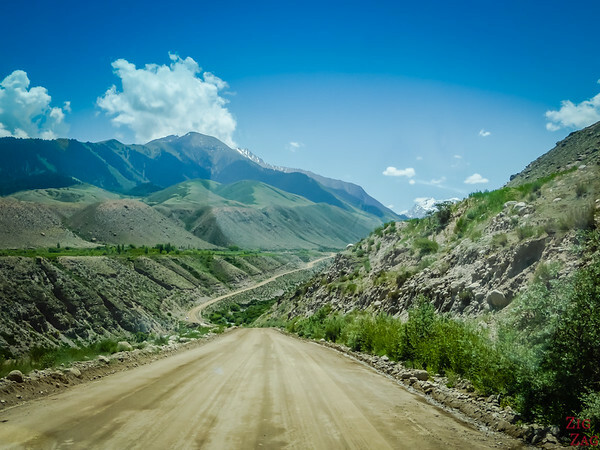 Our guide Masha and I felt courageous and we wok up early one morning to drive to the lake from Karakol and watch sunrise. 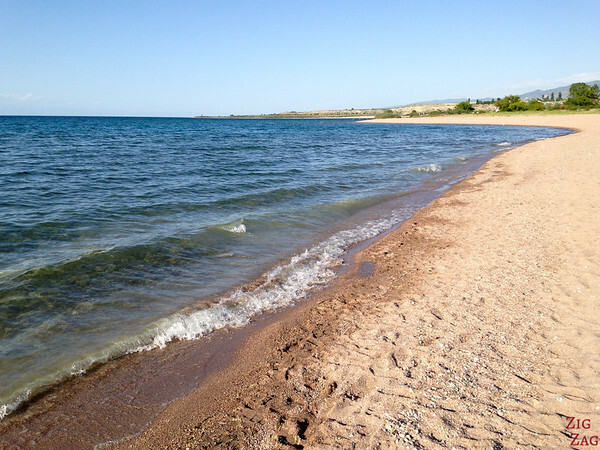 I have a clear preference for the South shore of the lake as the road stays close to the water most of the time. We found a nice spot. 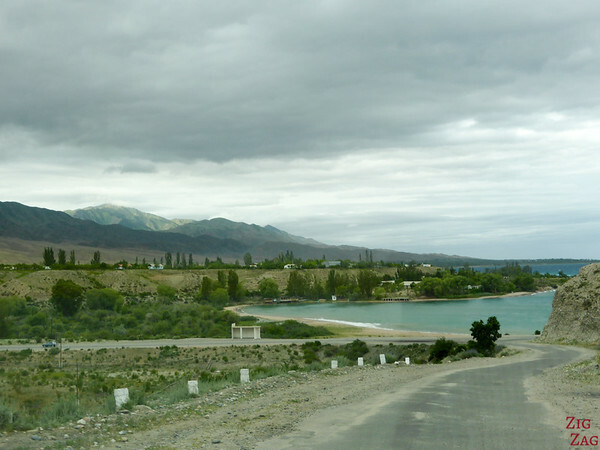 It is between Ak-Terek and Kichi-Jargylchak. From the road you can see what looks like a football field and easily walk to the shore. This detour is not worth a dedicated post so I am including it here. From the South Shore you can take a well maintained track that goes to a gold mine. A 15 min ​drive takes you to a statue to the glory of Youri Gagarine. Across from it are 2 waterfalls hidden under the trees if you feel like hiking all the way up. I did not. 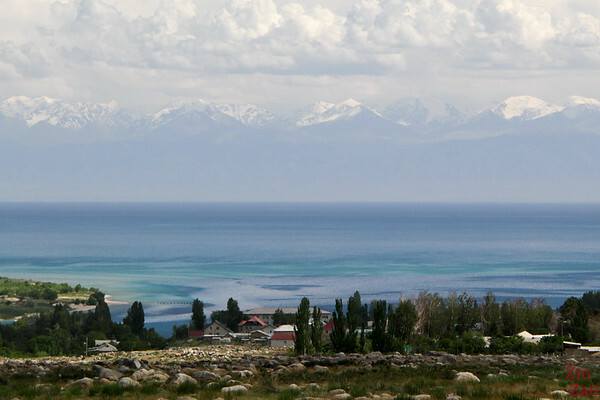 Wes stayed at the village of Tamga. Down the road there is a small beach protected in a cove. As I separated from the group to go see the Fairy tale canyon, I ended up at another beach 5 min drive west of it. After a very warm day, the cool water was very enjoyable. The next morning, the weather had completely changed. 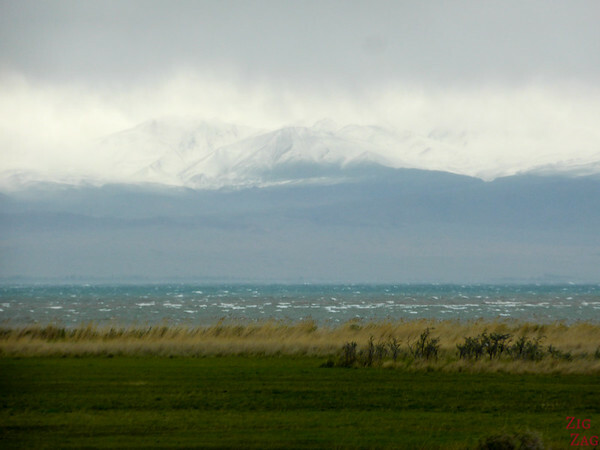 It was all cloudy, windy and cold. 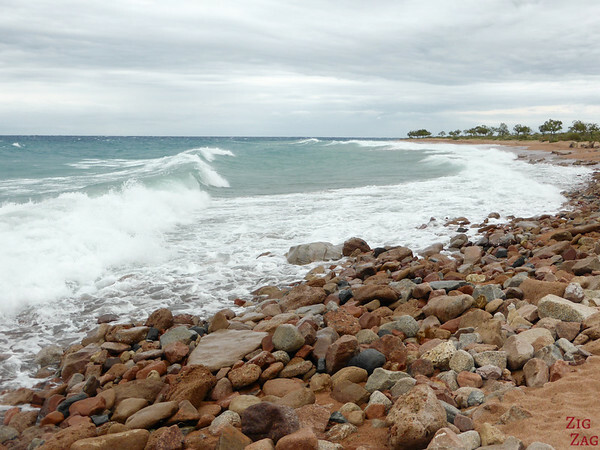 We were surprise to see huge waves like we were at sea. It was very hard to believe that this was just a lake. Watch the waves in the video! The whole time I was around the lake, I keep asking everyone if they knew where a particular photo had been taken. It is a stunning one. 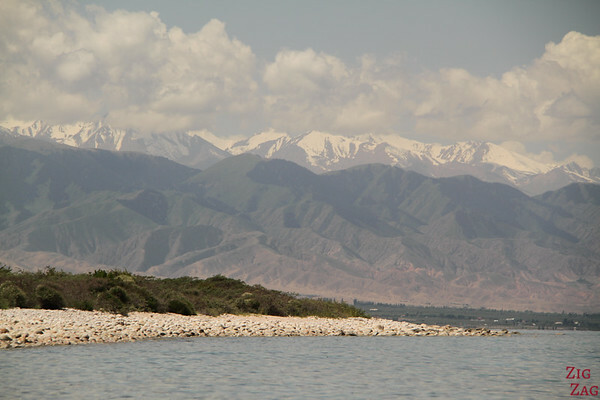 Even the Bradt guide has this photo in it but does not tell you where it was taken except at Issyk Kul lake (Thanks but no help). No-one seem to really know. Here is one shot of the place. Well I found the spot​. Sadly it was the day the weather was all cloudy and rainy. No perfect picture for me. But hopefully you will have more luck. I was roughly 45 minutes west of Tamga after you pass an abandoned entertainment complex her the village of Kaji-Say. Better at sunrise. As we were finishing the tour of the lake and driving towards the magnificent Song Kul Lake, the clouds and the lights created some misty atmosphere. Even though I get car sick and have to watch the road ahead I could not stop looking on the side at the mountains. All I could think of was 'see you another time!'. I will come back. You can also visit the following places but I have not done it. 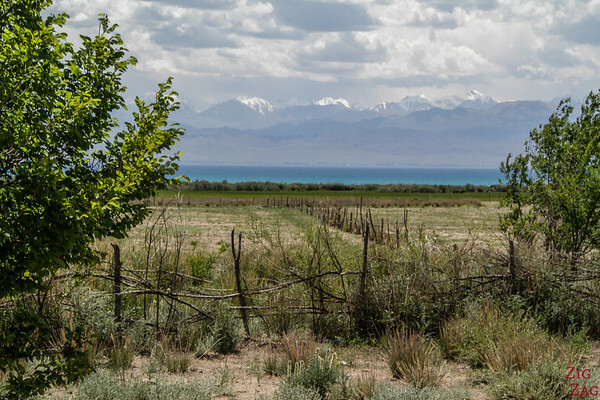 Want to see more of Kyrgyzstan's beauty? 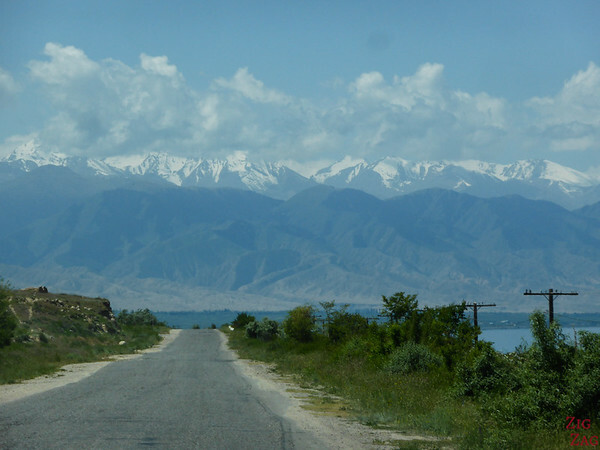 Discover more planning information, things to do and places to see in my online ﻿Kyrgyzstan Travel Guide. 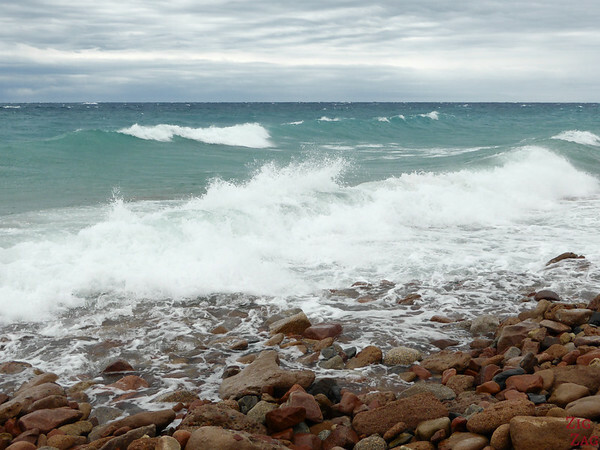 Have you ever seen a lake with such big waves?